I am aware that 2014 has come to a close and while it was a good year in many aspects and it would be unfair of me to say I am not grateful for the many blessings we received throughout the year, it was also our most challenging year physically, mentally, and emotionally. A quick side note - you may notice that my blog has gotten a little... well... skinny. I have decided to cut the fat. To blog with a purpose and only blog when the mood strikes me. I don't want this to feel as much like a chore as it did in the past. On here, you will now find only food (healthy AND unhealthy because I LIKE FOOD! Depravity is not my friend and I eat what I want, albeit in moderation. ), some tidbits about working out and my newest passion of RUNNING, and maybe (if I feel creative, some fancy DIYs (Not going to lie, I've got about 15,000 ideas and no time to do them... yet)!! I will (from now on...) be shying away from the more intimate details of my life. Except for today as I feel I have something important to discuss. Let's start with something good, to set a happy tone. TYLER AND I ARE EXPECTING!!! We are over the moon excited to share that we are expecting our second beautiful bundle of joy and the next great love of my life in June of THIS YEAR!! To say that we are ready to meet this tiny human is a drastic understatement. We aren't the only ones. Kylie is just smitten and will constantly say "no brother, only a sister". Much to her discontentment, we will not be discovering our child's gender until his or her birthday. There are so few surprises left in life so we're keeping this one. Plus, how cool will it be to have my HUSBAND tell me "we have a....". Maybe it's the hormones, but that just gets me in the tear ducts every time I think about it. Now we are (as I said) SO excited for this blessing, but it has been difficult to get into the "tell everyone and start planning the nursery" spirit. That brings us to the bad... just because now we can get it out of the way and establish that we have overcome the worst and still have so much to be thankful for. I understand that the topic is taboo and I understand that everyone views things differently, but please take into consideration that this is my story, my life, and yes, while it is private, I think it is important to address something that many people go through - but don't have the heart to discuss because, well, it hurts. A lot. On June 6th, 2014, Tyler and I found out we were pregnant. We were thrilled and ecstatic and all things excited for this little nugget and fear never once crossed our minds. Well, you know, apart from fear of having TWO little devils running around our home as opposed to one. We knew we could handle it, so we were all smiles. Then, about two weeks later, I started getting hints that something wasn't right. I called the doctor and the series of blood draws and ultrasounds began. She told me to prepare myself for a miscarriage. How do I do this? CAN one prepare themselves for this kind of emotional devastation? I called Tyler a dozen or more times. I needed somebody. I called my sister and even a very close friend (damn jobs preventing personal calls...) because I NEEDED somebody to tell me I was ok. That it wasn't my fault. That there's a chance the baby is fine. In hindsight I probably could've told Tyler I was going in for blood work so he could expect my call, but as they say, hindsight is 20/20. When Tyler finally called back, he said he'd be 20 minutes so I waited in silence. Well, silence apart from my foundation-shaking sobs. When he got home, I re-started the big ugly cry and told him (through an unintelligible mumble) what I remembered from my conversation with the doctor. I told him I felt guilty, angry, and like I failed. He assured me that it wasn't my fault and that it could be ok but if it wasn't, we would get through it together and try again someday. And that he loved me very much. On Father's Day, it was confirmed that I did not have the proper hormone levels to sustain pregnancy and we would soon lose the baby. We had a total of five ultrasounds and at least a dozen blood draws which lead us to this conclusion and the devastation was real. It was raw and painful and downright awful. It's the thing that you know nothing about because nobody talks about it, and for a very good reason. I feel like there is a certain amount of blame placed on the mom when an event like this takes place because there is such a lack of knowledge on the topic. Because of that lack of knowledge, it makes it impossible to discuss. I believe (from my perspective) that it's difficult to hear any kind of blame when you don't even have the emotional capacity to hold yourself together. It is the unspoken hell that we endured throughout June and July and beyond. The biggest stabs to the heart were when (while we were waiting for the inevitable end of the pregnancy) people would tell us "Time for another!!" or "When is Kylie going to be a big sister??". I understand that it's not their fault and that they never could've known... but it hurt a lot more than I ever thought. So, I cut myself off from everything. Personal e-mails, some in-person conversations, and obviously this little space here. I just. Couldn't. Do it. The entire process was exhausting and emotionally draining. I went in for surgery on 7/11. They completed the extraction of the failed pregnancy and (what felt like) the extraction of a very large piece of my heart. The amount of sadness we felt was indescribable. Recovery was fine and we were cleared to start trying again two short months later. Tyler and I have been so very blessed when it comes to conception. All three times we have conceived, it has been on our first try (I'm trying hard to see the positive in all of this). That means, on October 4th (less than one month after we started trying), we found out we were expecting. This time though, rather than excitement, we were filled with nerves and anxiousness. We so desperately wanted this baby to be healthy. To HOLD this baby. That's why we waited so long to share the news. But, after several blood draws and two ultrasounds, we are happy to say we are almost 16 weeks pregnant! Now, to polish this little (HA!) post off on a positive note, I have to mention the amazing things that 2014 brought to my life. I also learned to love harder. I let the little things matter more in a very positive way. I soak in everything that my little girl says to me because I know that all too soon, it will be gone. She will be grown and more filtered in her words and actions and while I hate that, I know it'll happen. So I will relish every second of her youth and the youth of all of my future children. The little things will matter and the bad things will be shrugged off. And finally, I learned that a strong marriage can endure anything. Let's be honest, I was a wreck. A messy, unattractive, constantly sobbing, train wreck. A lot of people have to step away from that and distance themselves from the leaching sadness. But one person stayed and helped me weather the storm that kept on coming. He held me and told me that everything would be OK and that we would get through this. I was never alone. It was always us as a team. When we miscarried, he said we would try again. When we found out we were pregnant again, he was terrified with me because he didn't want me to go through all "that" again, not realizing (or caring to admit) that he too suffered emotionally. He smiled the biggest smile both times we saw our healthy, wiggling baby. He is the best thing that has ever happened to me and I am so thankful he's mine. While the strength of our marriage was never in question, I can say without doubt that this experience brought us closer than ever. 2014 will never be remembered as the best year of our lives, but it WILL be remembered. Our lost one will be remembered and thought of and wondered about. 2015 will be a year of change. A year of excitement and trying to live positively. It will also be the year we meet our next great love. I'm so very, very sorry to hear of your loss. That is never something easy to go through and process. You're a strong lady (by the looks of it!). I'm so glad you both decided to give it another go. My best friend decided after one miscarriage not to try again but who knows, she may change her mind in the future. Congrats on your baby news! 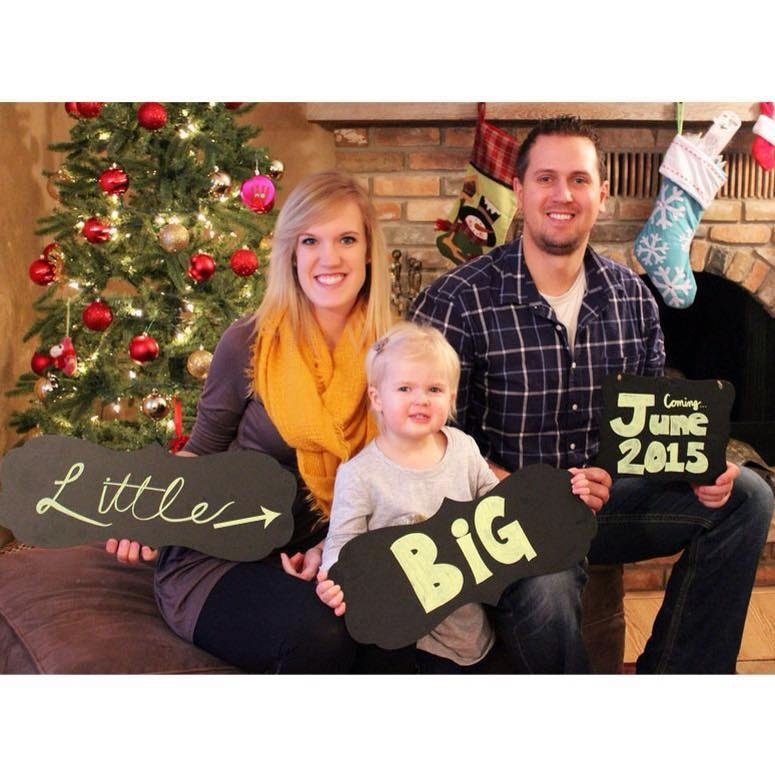 So sorry to hear of that heartache, but thankful for a new little one on the way! Congrats again! Kylie will be such a good big sister! So sad to hear about all you've been through!!!! Sounds like you've got so much to look forward to and an INCREDIBLE support system! XOXO Congratulations Mama! Happy 2015!